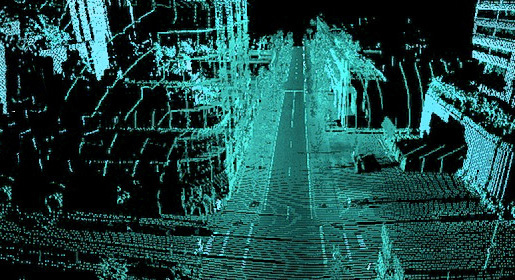 Available to download from Google is a small part of the data set from Radiohead's recent House of Cards music video, shot entirely without cameras -- just LIDAR and 3D capture. Part of the idea is that fans will be able to remix the "footage" or mash it up in some way. This is tremendously cool and very thoughtful of Radiohead to copyleft this part of their work. Unfortunately Google or Radiohead has only provided a one minute sample of the animation data, which isn't much to work with. Of the 14,000 data downloads and counting, I think this probably explains why no one has come up with anything too striking on the YouTube Remix Group. Still, I grabbed the data and got to work. First step: better tools. Personally I feel the Processing code is just too slow and painful to work with. OpenGL really needs to be run through native code. So the first app I wrote is a Obj-C based first-person browser of the city street landscape (which includes 1.3 million vertices). It's intel Mac-only and completely untested, but if you're daring it might be fun to play with. It takes a couple seconds to load all the points, but then runs surprisingly fast. I get 30fps on my first-generation MacBook Pro. You can download it [FIXME: HOC-CitySceneViewr.zip] or watch a quick demonstration on YouTube. This project and Thom Yorke Orbit are both layered on top of a custom OpenGL threaded graphics framework I built four years ago. In a way it has kind of evolved into its own mini-version of Processing, without the performance penalties. It's not clear to me how the Geometric Informatics capture hardware works. What's the technology behind it? How much does their GeoVideo system cost? I'm having a hard time finding this out.